Before there was Dragonball Evolution, there was Akira Toriyama's crisp, colorful art. His work seems taken from children's books rather than a gut-punching martial-arts tale, but incongruity is what makes his manga appealing. Gallery below. Toriyama used only very few assistants compared to most manga artists, so his work lacks the stiffly drafted backgrounds and obviously traced photos which give so many manga a cookie-cutter look. 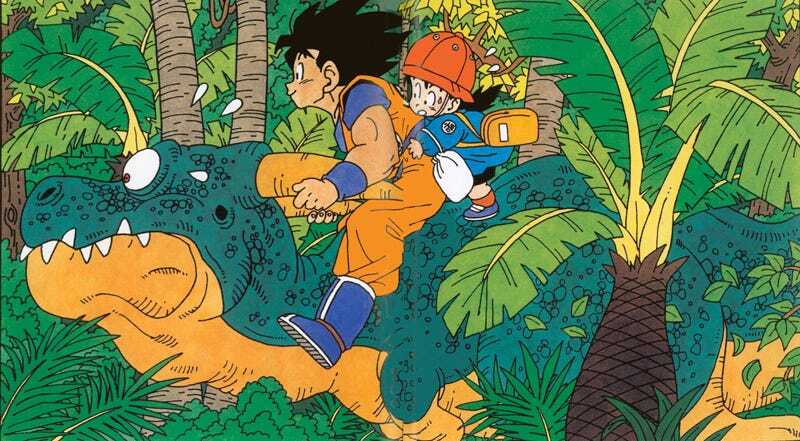 Dinosaurs, dragons, monsters, and strange sci-fi vehicles of all kinds float through the strange world of Dragon Ball. If his style looks familiar, he also did the art for the Dragon Quest video game series. We've created a gallery of some images from Dragon Ball and Toriyama's first series, Dr. Slump. Jason Thompson is the author of "Manga: The Complete Guide" and the forthcoming Del Rey graphic novel "King of RPGs". As a manga editor for Viz and Random House, he has worked on the English editions of Dragon Ball, Yu-Gi-Oh!, YuYu Hakusho, Uzumaki, Fullmetal Alchemist and many other titles. Isn&apos;t Dragon Ball just a bunch of speedlines and ripped dudes with bad hair screaming "It&apos;s over 9,000!"